This process is deprecated/on indefinite hold. See this Meta post for updates from the DAG team, and this other one for more context on the changes in the process. On a weekly basis, the Community Team vets a handful of feature requests to be sent over to the engineering team and estimated, scheduled into next month's plan, and built (or sometimes rejected for technical reasons). We try to select things that we think can make the most people happy, and can also be done in about one to three days by a developer. Or, in other words, something relatively self-contained that doesn't require an elaborate spec, a lot of discovery by/with many other teams, and doesn't really alter the product itself in major ways. We usually send over around 10 of these a month. Some of these are grabbed from the various Metas across the network, some are written by the Community Team themselves. Some have a lot of visibility in all sites of the network, some are only minor tweaks to background stuff, some are improvements to moderator tools, and some are improvements to the tools the Community Team themselves use. We'll start posting monthly updates on what features from that board were built, rejected, or punted, as answers to this question (one answer per year), with the objective of giving you some insight into our process. Features in the "built" lists marked with a "‡" were in the QA phase at the moment the post was edited. They'll appear on subsequent months' "built" list if further work was warranted, or won't if they just cleared QA successfully. We’ve always known that we have some technical debt that would eventually require payment; work on Teams has revealed that the extent of this debt reaches quite a bit further than we hoped. As integrating Channels requires us to dig into every system supporting and surrounding Q&A, we’d like to ensure that we don’t add anything else to the pile while we get things sorted out. To that, we’re going to be putting a freeze on all new features while we start paying off some interest. Note that this doesn’t include work on testing the new ask question templates or bugs that surface while we straighten out some messes - those sorts of things will still get the attention that they need. What we can’t do is introduce any new complexity into what we’re currently sorting out, which involves quite a bit of things both supporting and surrounding our core Q&A product. We appreciate your patience during this period, and we’ll update you again as soon as we have a better ETA on when we’ll be able to start scheduling new features. Unless a feature from the "punted" list at the bottom of this post gets built or rejected, this post won't be getting any new updates either. Stay tuned for updates on what the DAG team's been working on here. The Community Team sent over a few features to the DAG team after discussing them (added to the bottom of the post, in the "punted" section), but unfortunately nothing got built this month. ‡Automate the profile deletion process more — There are a lot of cases in which a human who works at SE is needed to intervene when a user wants to delete their account, and we want to try to reduce that. Add downvote to LQR queue possible actions — Relevant Meta post, which has been answered with the outcome of our discussion. Update! Woo! A lot of stuff got built. And as a spoiler for next month, another six items on the list are presently being worked on too! Make sure disassociated posts don't show up in the network profile. However, the new Developer Affinity & Growth team is now officially... well, a team — they have a clear structure and goals! That means we might be closer to figuring out what "a normal month" in this process looks like with this new team. That being said, and to avoid falling into a pattern where we consistently try to predict what that looks like (and possibly fail at doing it), I'm not gonna estimate when we'll be "back in full force" again. Instead, I'll tell you what we're predicting July will look like: we're gonna have a set of extra hands helping out in trying to cut down that "on wait list to get built" list at the end of this post significantly — three of the items on the list are already being worked on at the moment! Change guidance when trying to self-delete question with upvoted answers — Relevant Meta post. Update! Our new PM concluded his onboarding process this past week, so April didn't see a lot of feature requests get built — as expected, and accounted for in March's update. This should ramp up in May, and be back in to full force in June, though. ‡Changes to the way annotations are propagated to other sites, or overarching network account — Relevant Meta post. This one has been split into multiple parts, and work on some of them (work on chat profile annotations propagating to the overarching network account [only visible to CMs at this point] is undergoing) have been built. ‡Allow post owners to override suggested edit decisions — Relevant Meta posts here and here. ‡"Add customizable hero for international users" — Allow for the ability to customize the big "Join the Stack Overflow Community" banner we display on Stack Overflow to invite users we know speak the languages we have localized Stack Overflow in, so they can be invited to join the international Stack Overflow communities instead. 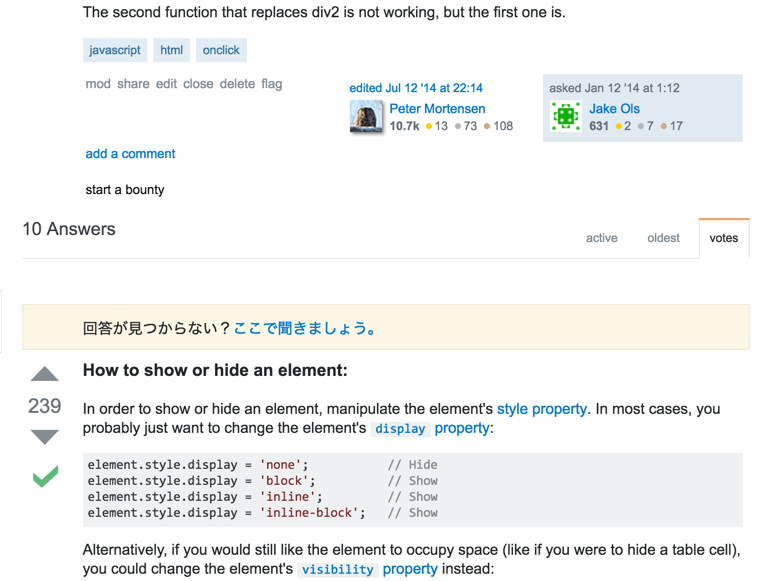 Fix delay with link dialog on Stack Overflow Documentation — Relevant Meta posts here and here. "Allow users to delete network profiles when there are no per-site profiles" — upcoming changes (which should cause the network profile to be automatically removed in these instances) makes this request obsolete. Keep "Friendly tag name" feature, expand to all sites, show in tag pop-up — "Friendly name" here being a thing we rolled out for Docs (on SO). For instance, [sql-server] is "Microsoft SQL Server;"
Auto-import translations from Transifex — New strings that need translation on International SOs need to be manually imported by a CM, and we'd like to change that. Not the answer you're looking for? Browse other questions tagged support feature-request-process . How Does the Community User Set Bounties? What are the criteria for Community to bump a question? Why does a suggested edit without any rejections get classified as … a rejected edit? What goes on behind the scenes when determining if a badge should be implemented?